For young girls growing up, there's a lot of pressure to confirm to what "society" thinks you should "be". But what if you want to do things different? What if you want to "be" what you want instead of what other think? Note: I received Disney Nutcracker globe and bluray/dvd for review purpose. Any personal views expressed are always 100% my own. It's not easy to be different. I remember the stress of being a teen, who was into scifi and who day dreamed about the future. At that time I was nerdy. LOL. But girls should be allowed to be themselves, whatever that means. Like my niece. My niece was my first baby many years before my son. Over the years I've watched her grow. Like any child, my niece did all the activities kids like to do. The family soon discovered that sports are her thing. And she became a track and basketball star. But she didn't stop there. My niece is also into being creative. She's currently taking a sculpture class, which she was excited to tell me ALL about. She's really enjoying the class and discovering ways she can be artistic. She made me smile. 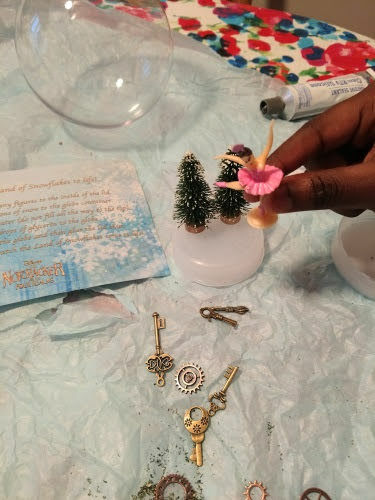 To encourage my niece to keep being creative....and yeah also to get some one on one time with her.....I asked her to help me put together a snow globe I received as part of "Disney's The Nutcracker and the Four Realms" Bluray/DVD/Digital HD release. 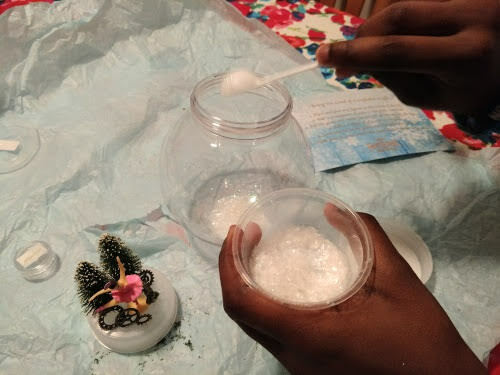 Being a teen, at first she was like "snow globe"?! But once I took out the package and explained that she could put it together however she wanted....I don't have to tell you she became excited. And so we built the globe and talked. Built the globe and laughed. Built the globe and encouraged. 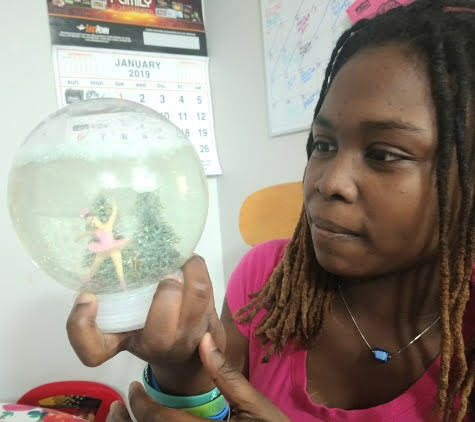 While my niece has an idea of what she likes doing, she's still a teen with questions and fears as she nears womanhood. Lets be honest the pressure increases in some ways. Especially for black girls. So during our talks I encouraged my niece to keep being herself. Whoever "she" is. Yes we change as we grow older and that's okay. We can change. We can let go of things to start doing new things. There's no set rules except be yourself and do the things that make you happy. You will figure it out. And when she does, I'll still be here to support and encourage her. Just like me niece, Clara in "Disney's The Nutcracker and the Four Realms" has to discover who she is. Thankfully she also has friends and family who encourages Clara to be her creative self. Learn how by watching "The Nutcracker and the Four Realms" now available on Digital HD and Blu-ray/DVD. Disney's dazzling adventure "The Nutcracker and the Four Realms"- inspired by E.T.A. Hoffmann's classic tale and the beloved ballet "The Nutcracker"- carried audiences along with 14-year-old Clara (Mackenzie Foy) to a magical, mysterious world with breathtaking performances by Misty Copeland plus sweets, snowflakes, soldiers, scurrying mice... and no shortage of surprises. Bonus features include a discussion with American Ballet Theatre’s Misty Copeland about her role as the enchanting Ballerina Princess, her personal history with “The “Nutcracker” ballet, and her inspirational and historic rise within the world of dance. In “The Nutcracker and the Four Realms,” Clara travels along a golden thread, presented at Drosselmeyer’s (Morgan Freeman) annual party, eagerly searching for a one-of-a-kind key that will unlock a music box that holds a priceless gift. When she enters a mysterious parallel world, Clara encounters a Nutcracker soldier named Phillip (Jayden Fowora-Knight), a gang of mice and three Realm regents, including the Sugar Plum Fairy (Keira Knightley). Ultimately, she must brave the ominous Fourth Realm, home to the tyrant Mother Ginger (Helen Mirren), to retrieve the key and return harmony to the unstable world. Unwrapped: The Visual Effects of “The Nutcracker and the Four Realms” - View a reel that explores the layers of effects in sequences of the film. Entries must be made on or before 11:59 p.m. February 5, 2019. I want to win to see this movie. I would like to see this movie because it looks like an interesting movie that's different than most. We always go watch this at a theater production in December every year and my daughter loves it. I would love to win this version of The Nutcracker for her to see. I want to win for my granddaughter. My little ballerina. I like that this is a classic story retold. I would love to share this dvd with my sons. I wanted to see it in theaters but I never got a chance to. I would love to see it now. My daughter used to dance in the Nutcracker every year when she was younger, now I would love to watch with my grandkids. I love it. I have never seen The Nutcracker. I would love to watch it with my kids. I'd like to win this prize to share with my daughters. We have not seen the movie yet. I would love to win because I've been wanting to see this movie since I seen the previews back this fall! I would love to win this because my little girl has been asking to see it. Our family loves the Nutcracker play and we really would like to see the movie. I would love to see the Nutcracker and the 4 realms. My daughters cant wait to see it as well! I absolutely love the Nutcracker! I did ballet for years! I would like to win for our girls, they will love it. I'd like to win this for my family to enjoy together. I love classics, and The Nutcracker will always be one of my favorites. My daughter has never seen and would love for her to see it over and over each year. I have loved The Nutcracker since I was a little girl. I hope to have my grandchildren learn to enjoy it with me. I would love to win this to watch this with my daughter, who did ballet for 6 years. She actually performed in the Nutcracker. Thanks for the chance! I want to win because I think nutcrackers are awesome! Havent' seen it yet and it has me intrigued. I spent the Christmas season watching the commercials and really wanting to see it. I don't like going to movie theaters so winning this movie would be perfect. I really love the snowglobe you and your niece made. I would like to win because we haven't watched this movie yet. I'd love to win this because I love the story of the Nutcracker, and I haven't seen this. Did not get a chance to see in the theater, would like to see this movie with my family. I loved the original and cannot wait to see how the new retelling goes. I would love to win and see Disney’s The Nutcracker and the Four Realms Bluray/DVD. I would share with my niece also! My niece takes Ballet. I want to go the movie to her. I would love to watch this with my granddaughter -- we would both really enjoy it. I would like to watch this with my son! It looks like a great family movie! I would love this watch this with my family. I would like to win this DVD because it sounds fabulous. I'd love to watch it with our family. Would love to watch with my daughter! My daughter was in the Nutcracker ballet this year and would LOVE to see the movie! Our whole family loves the Nutcracker! We wanted to see this in the theater, but the holidays got so busy, we never got over there. I'd love for us to be able to watch it together now in our family room! I'd like to win it to give to my niece. I'd like to win so my daughters & I can watch this together. I have always loved The Nutcracker ballet and have not seen this movie version yet! I would love to win because I know it would be a movie the whole family would enjoy watching together! I want this for my granddaughters to watch. Would love this for my granddaughter. Thank you. I want to win so I can see this with my daughter. I took her to see The Nutcracker ballet by the Moscow ballet company and she loved it. I would love to win this for my daughter. We didn't get a chance to see it in theaters when it was out. My grandchildren would absolutely like to see the cool, Disney's The Nutcracker and the Four Realms always.. I have grandchildren that would definitely like to watch the amazing, Disney's The Nutcracker and the Four Realms everyday. My nieces and nephews would really enjoy seeing the marvelous and fun, Disney's The Nutcracker and the Four Realms for a great time..
A wonderful, Disney's The Nutcracker and the Four Realms, my grandchildren would always like to watch for lots of fun,. 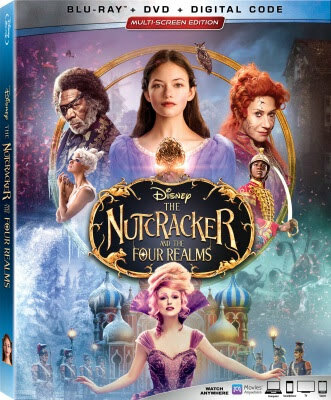 I have nieces and nepbews that would enjoy seeing a fabulous, Disney's The Nutcracker and the Four Realms many times. My many children would just love to watch the awesome, Disney's The Nutcracker and the Four Realms for a fun time.